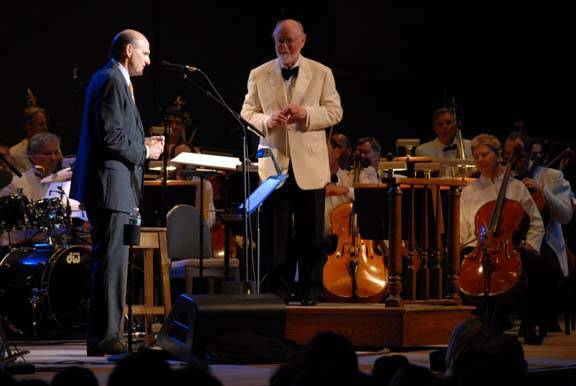 Review of James Taylor with the Boston Pops and John Williams at Tanglewood, July 1, 2011. July 1, 2011 concert reviewed by Dave Read. 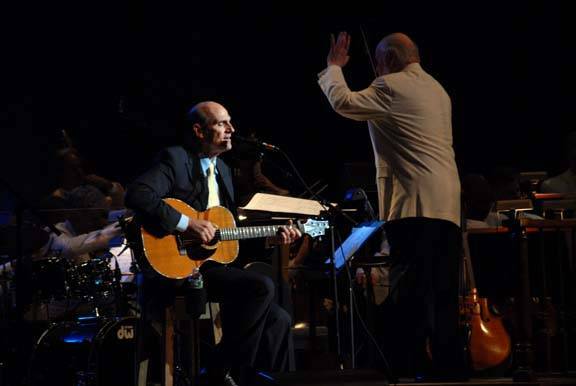 The Boston Pops tuned up for their annual 4th of July concert for hundreds of thousands on the Esplanade in Boston by sharing the bill at Tanglewood on July 1 with James Taylor for a relatively intimate gathering of eighteen thousand souls. Led by laureate conductor John Williams, the Pops had the Koussevitsky Shed stage to themselves for the first half of the program and fairly thrilled the audience with a suite of excerpts from Williams compositions, opening with a fanfare for the city of Boston called Jubilee 350, and including pieces from the movies Far and Away, Cath Me If You Can, and Superman. The Pops got to display their jazz chops for the Escapades from Catch Me If You Can, which featured an ad hoc sax, vibes, and bass trio that the crowd applauded loudly, especially the solo bass coda that allowed simple notes to reverberate through the Shed with the same force, but maybe more eloquence, as a multi-instrument finale. After intermission, James Taylor appeared, looking like a tycoon in suit and tie but seeming somewhat like a tyro – displaying an unusual nervousness. Undaunted, he began with an ironic choice in his chosen hometown, Getting to Know You, even whistling some. But just a few tunes into the set, by the time keyboardist Larry Goldings had taken the lead on Mean Old Man, Taylor seemed completely at ease. Perhaps it took the involvement of his sidemen, Goldings plus Jimmie Johnson and Chad Wackerman on bass and drums, for him to achieve work mode? Whereas the artist named James Taylor is an individual, there’s a performer with the same name who’s hardly ever alone, and who is most comfortable while plying his trade amid peers. It was an earlier James Taylor Boston Pops John Williams triple bill that set an attendance record of 24,470 which resulted in such traffic snarls that the BSO promised the towns of Lenox and Stockbridge to cap ticket sales at 18,000.